Last year, a few days after Thanksgiving, I got an email from some guy name Brian Joines who was writing a "dark comedy action" comic about some Alpine Christmas legend called the "Krampus." He had seen some of my work online and wanted to know if I was interested in drawing the book. Both Brian and the Krampus were unfamiliar to me, but "dark comedy action" and I were old friends. I like my comics fun. And scary. And a little off the rails. I believe comics are often at their best when they're unpredictable: the doodles and screeds in a 12-year-old's secret notebook. Something you might not want to show your parents. Gut-busting inside jokes among friends. Politically incorrect and honest. Well, as he told me about the book he had planned, I realized this Brian guy's story and sense of humor were right up my alley. We chatted some more, did some sample pages, got the green light from the fine folks at Image Comics, and went into production. Along the way Brian roped Ron Riley into coloring the thing and asked Charles Pritchett to handle the lettering. With them on board, the final pages make my scribbles seem almost professional. 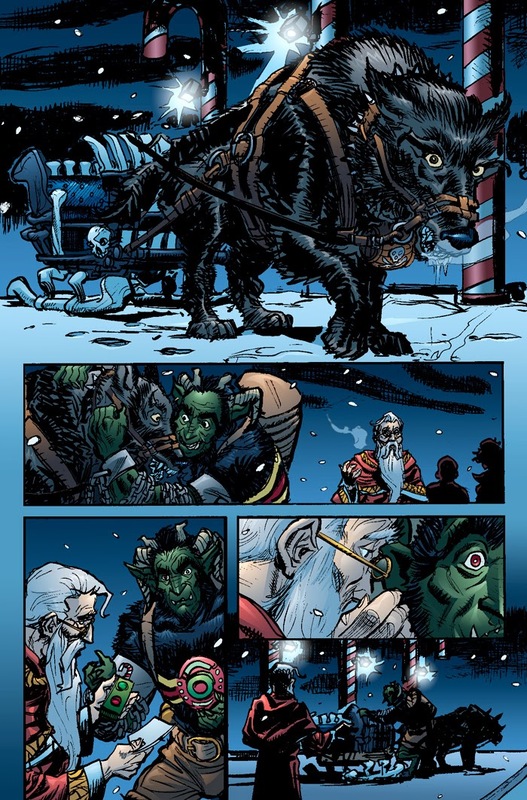 This coming Wednesday, just over a year after Brian's initial email, Krampus! #1 will be in comic stores. I'm biased, of course, but I think you'll like it. Krampus! is a character and story perfectly suited for a medium that used to be called "funny books".